At Ringsted Library you don’t have to walk very far to experience relevant, digital, inspiration and functional service. At central points in Ringsted Library the library user can attend Libry Butler, which meets all needs for service and inspiration most library users have. Ringsted Library wanted to create vivid inspiration and efficient service in the library room, regardsless of where the library user is located. A simple and inspiring design in a digital solution, which was placed at central points in the library, created the vivid inspiration and service, which Ringsted Library wanted for their users. The answer was Libry Butler. 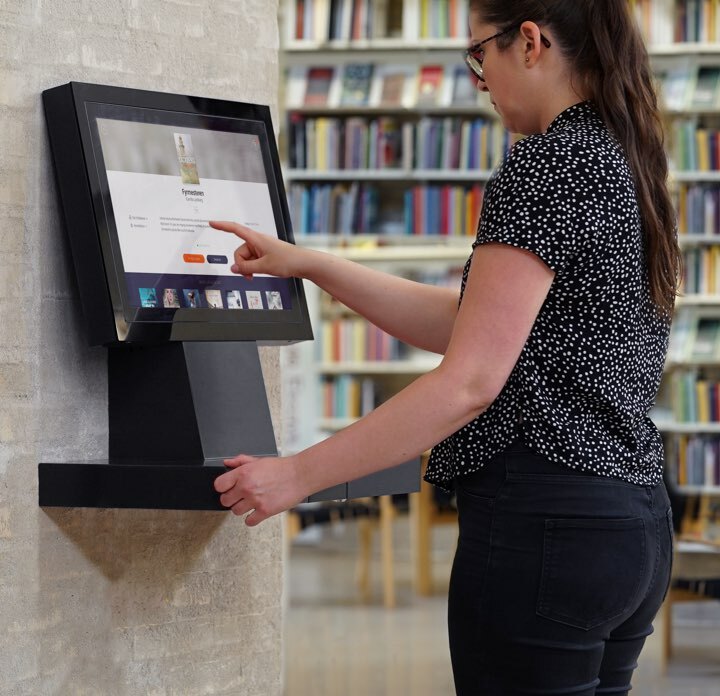 With 3 digital installations of Libry Butler in the library, the users at Ringsted library is never fra from inspiration and functional service. Search, borrow, return, pay, inspiration! In many libraries the user will do their searching for materials at the library’s website at computers in the library room, but the computers are also used for many other purposes. When the library user will borrow og return materials it happens at the self-service machines. Payment of fees happens at the website with credit card. Relevant, digital, inspiration exactly where the user is located, requires another digital installation. All this is now put together in one installation – Libry Butler. Libry Butler is partitioned in modules, which means that the library can choose which features they want to activate or deactivated – depending on which features that are relevant in the library. At Ringsted Library they chose to activate search, mobile payment, user status and inspiration. They placed 3 Libry Butler at central points in the library, where users often pass by. Ringsted Library always have the option to activate other modules – e.g. borrow and return. To design a user friendly product with Libry Butler’s many features is an art form in itself. Design and function must be coherent. Functional design must explain itself and be intuitive in a user scenario. User friendly design must be simple. Inspiring design must be aesthetic. Libry Butler is design to handle self service in many user scenarios. Visual design and simplicity is paramount. The user should never be uncertain about what to do. Ahead of the development of Libry Butler we performed user interviews and analysis in the effort to create the best product from a user perspective. Next to that the staff of Ringsted Library contributed with important input to which needs, Libry Butler should meet. Development in dialogue with users and library staff is priceless and absolutely necessary in development processes of new, relevant, digital, solution for libraries.